Glioblastoma multiforme (GBM) is the most common and most aggressive type of primary brain tumor in humans, involving glial cells and accounting for 52% of all parenchymal brain tumor cases and 20% of all intracranial tumors. Despite being the most prevalent form of primary brain tumor, GBMs occur in only 2–3 cases per 100,000 people in Europe and North America. 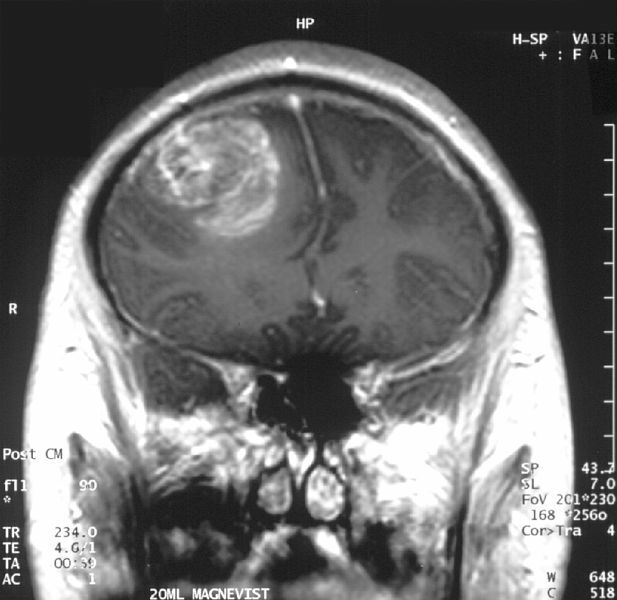 According to the WHO classification of the tumors of the central nervous system‎, the standard name for this brain tumor is “glioblastoma”; it presents two variants: giant cell glioblastoma and gliosarcoma. Glioblastomas are also an important brain tumor of the canine, and research is ongoing to use this as a model for developing treatments in humans. Treatment can involve chemotherapy, radiation, radiosurgery, corticosteroids, antiangiogenic therapy, and surgery. Glioblastoma has a very poor prognosis, despite multimodality treatment consisting of open craniotomy with surgical resection of as much of the tumor as possible, followed by concurrent or sequential chemoradiotherapy, antiangiogenic therapy with bevacizumab, gamma knife radiosurgery, and symptomatic care with corticosteroids. Other than the brainstem gliomas, it has the worst prognosis of any CNS malignancy. 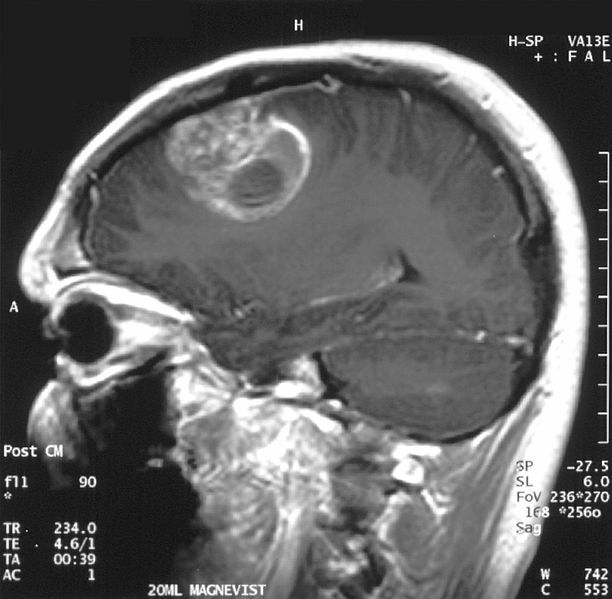 When viewed with MRI, glioblastomas often appear as ring-enhancing lesions. The appearance is not specific, however, as other lesions such as abscess, metastasis, tumefactive multiple sclerosis, and other entities may have a similar appearance. Definitive diagnosis of a suspected GBM on CT or MRI requires a stereotactic biopsy or a craniotomy with tumor resection and pathologic confirmation. Because the tumor grade is based upon the most malignant portion of the tumor, biopsy or subtotal tumor resection can result in undergrading of the lesion.